Lake Point Tower is a high-rise residential building located on a promontory of the Lake Michigan lakefront in downtown Chicago, just north of the Chicago River at 505 North Lake Shore Drive. It rises somewhat apart from the urban cluster of downtown Chicago in a composition that sets off and punctuates the skyline. 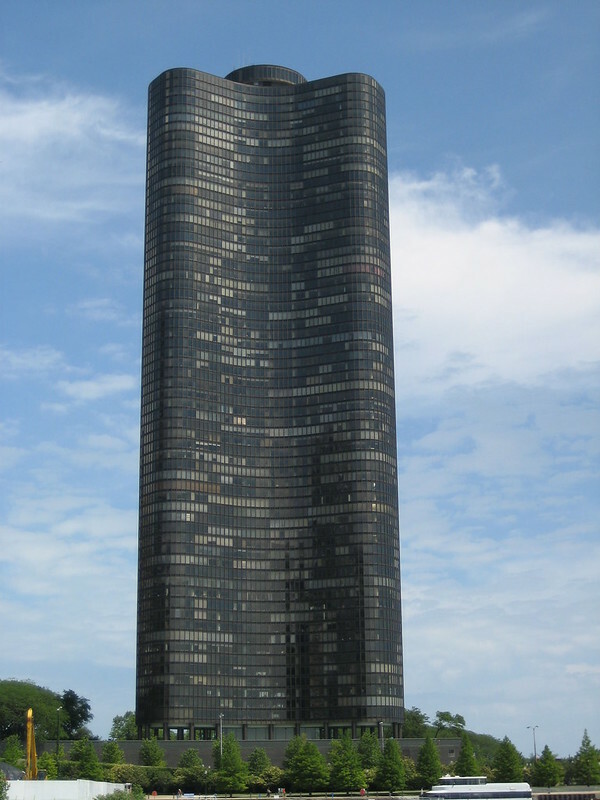 The building is also the only skyscraper east of Lake Shore Drive. It was completed in 1968, is over 600 feet tall, and was the highest apartment building in the world at that time. It was the first all electric high rise residential building in the world and pioneered the concept of the "Park in the City" being the first such residential complex in a major city to have a two and one half acre park and waterfalls three stories above ground. Image published by bousinka on 2008-07-10 02:53:59 and used under Creative Commons license.